After winning the 2015 elections, President Muhammadu Buhari created a storm when he accused then US President Barrack Obama of aiding and abetting Boko Haram terror by blocking the sale and supply of military equipment to Nigeria. The US had at the time quoted Leahy law stipulations in denying Nigeria needed equipment. Today, unwittingly, and I dare say unintentionally, President Muhammadu Buhari is himself accused of the very same but to a much more treacherous and treasonable degree. 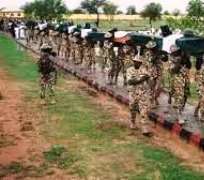 A recent report in the Vanguard newspaper quoted a Nigerian soldier who “survived” the recent massacre of over 200 soldiers at Metele, Borno, as stating that the terrorists who killed the troops in that attack had been captured by his battalion but were suspiciously and treacherously released on orders from above. The soldier went further to verify the actual numbers killed in the attack as over 200 as supported by local and global media reports and prior accounts of venting troops. He accused CoAS Tukur Buratai of lying and further sabotaging troops' morale by denying the dead and the state of ill preparedness. The soldier lamented that many of his dead colleagues were owed allowances for over 6 months till their deaths! It is not the first time that the Buhari government has been accused of freeing deadly Boko Haram terrorists who come back to kill Nigerian troops and civilians. Shuaibu Moni was reportedly released in one such arrangement and he immediately released a video in which he threatened the Nigerian state. It is shocking that in what would account as a direct act in support for terror, Nigeria’s military leadership could have ordered the release of deadly terrorists back into the field to again massacre Nigerian troops and civilians. What is going on here? Indeed the Buhari government’s recognized extreme compassion for Boko Haram terrorists is not new or news at all. Buhari has held that view toward the terrorists ever before he was sworn in. On record, Buhari a notable elder citizen at the height of Boko Haram attacks never condemned the group but rather protested against the then Goodluck Jonathan’s government for killing the terrorists, arguing that they should be rewarded as MEND Niger Delta ex-militants had been. Buhari has never denied this record. Nigeria's anti terror bill prescribes harsh punishment and even death for acts in aid of terror. Recent trials conducted under the Buhari administration for Boko Haram terrorists arrested by the previous Goodluck Jonathan government have been a sham as a report by Amnesty International this week reaffirmed. [See PremiumTimes of 10th December 2018: https://www.premiumtimesng.com/news/top-news/300003-nigerian-govt-shielding-military-officials-boko-haram-members-who-committ-atrocities-amnesty-international.html ] The terrorists have been tried in secret and sentenced to a few months to one or two years if at all. None has been sentenced to death as dictated by Nigeria’s anti terror Bill and as has been done in Cameroon and Kenya. We recall that when former President Musa Yar’Adua of esteemed memory granted MEND an amnesty he obeyed the law by consulting with the Council of State as section 175 orders. In granting late Diepreye Alamieyeseigha an amnesty former President Goodluck Jonathan likewise consulted with the Council of State as stipulated by law. Buhari did no such. The reason for this constitutional stipulation and implications of reckless amnesties as granted by Buhari today are being felt by our civilians under siege in Borno and our gallant troops being killed for sport by terrorists Buhari sets free. The war on terror is a source of cash. Equipment procurement, logistics, feeding and several other avenues are “tsunamic” while war rages . The continuance of the war is lucrative for Nigeria’s military leadership accused of being gravely corrupt. Additionally Boko Haram is believed to pay military commanders directly to lose wars and abandon equipment for their use. To make matters worse, even the foot soldiers in the northeast war theater have been accused of taking over all farming and trade in that region, enslaving the local populace who are unable to farm due to the persistent state of insecurity. Negotiations with Boko Haram are done in private and National security officers have this as a means to allegedly loot billions schemed off secret payoffs to Boko Haram. With National security billions all over the place in a nation run on corruption there is no impetus to end the war and covert and brazen support for Boko Haram by Nigeria’s military and civilian leadership is no surprise. There needs to be a dynamic shift. Our soldiers and civilians’ lives are too precious to continue to be placed in the hands of Boko Haram. We resound Amnesty international’s call to the International Criminal Court to take decisive steps against Nigeria’s Commander in chief, President Muhammadu Buhari and military leadership.